What were you doing twenty years ago today? 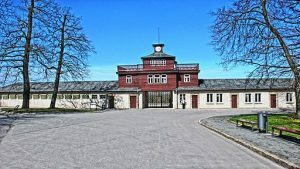 You probably don’t remember exactly, and neither do I, not exactly, but it is quite likely that by now on a Sunday in 1999 I would have been out in the cold and snow giving guided tours of the Concentration Camp Memorial Site that I was volunteering at in Germany. By now I may have shown people the rooms where people were systematically killed, the ‘pathology laboratories’ where spurious medical ‘examinations’ and ‘experiments’ were carried out, the crematorium where bodies were burned at the most alarming rate imaginable. That year was, and remains, one of the most important experiences of my life. Imagine then, how gutting it is to see the news today that 5% of adults in the UK still deny the Holocaust and that 8% believe the number of people killed has been exaggerated. I simply cannot get my head around how, with the mass of evidence available, that people still feel able to deny the genocide perpetrated by the Nazi regime only a few decades ago. There are a number of amazing museums and memorial sites around the world that serve as testament to what happened. They preserve, display and interpret the material culture, the oral testimony, the memories, the stories of this most awful period in human history. But this work is not just for concentration camp memorial sites and Holocaust museums, it is for all museums. Of course, when we go to a museum, we often want to see the best of human history. We want to see great art and magnificent beauty. Museums often seek to exhibit the pinnacle of human achievements and creativity. But museums are failing if they do this without also collecting, displaying and interpreting the terrible deeds perpetrated by people as well. To only display great art and beauty is to only display one side of human history. With the level of denial that still exists, we have a responsibility to show the evidence of the darkest aspects of our human history, so that there can be no doubt about the realities of the Holocaust and other genocides perpetrated by one man against another. For me, that means that, in order to prevent a recurrence of such an atrocity as the Holocaust, we all, every institution, every individual has a responsibility to think about the impacts of the persecution, the discrimination, the prejudice that we find throughout our society today. Museums, as mirrors of human existence, have a very particular role to play here. They must collect, preserve and interpret the evidence of such deeds today, so that people cannot, in the future, claim that such atrocities did not happen.